The great Kagyu Lineage Holders, Rinpoches, Lamas and Khenpos have shown us all a wonderful example of how we can continue to work together to fulfil the aspirations of His Holiness the Gyalwang Karmapa. The Kagyu Monlam continues to grow. 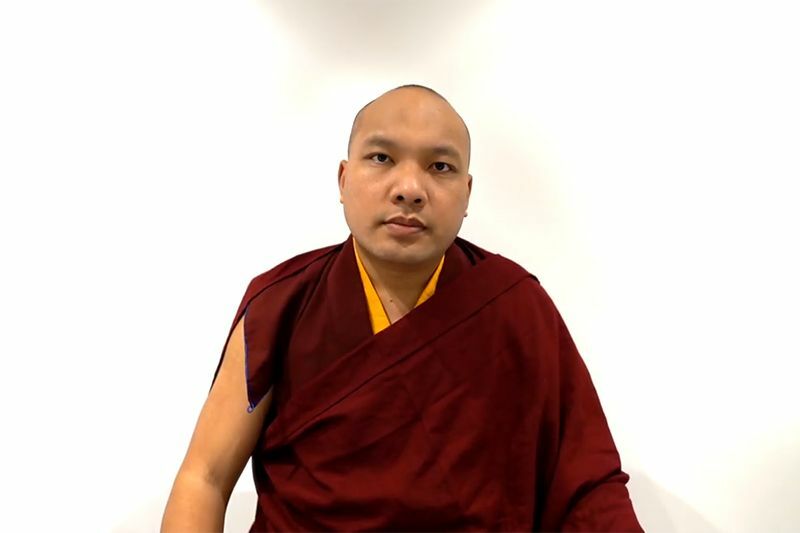 There are various humanitarian projects connected to the Kagyu Monlam that express His Holiness Karmapa’s vision of a world where we all look after each other with kindness. Compassion in Action is flourishing and this year another new initiative has been added. Close by the magnificent Monlam Pavillion is a room in a small hotel where a pilot project is running to empower young local women taking part in a 2-month sewing training course. The Sewing Happiness Project started on 1st December 2018 and will run until 30th January 2019. A group of 18 women, between the ages of 15 and 33, has been gathering for two hours each day, six days a week. The training has been delivered by two skilful local teachers who have previous experience in this type of project. The course has been designed as an introduction to sewing and tailoring, including: using a sewing machine, hand sewing, using fabric and understanding patterns. The aim is that by the end of the course the participants will be able to repair items of clothing and know how to make six useful types of traditional garments. This programme was the brain child of Jangchup Lingpa, the Secretary of the Kagyupa International Trust. Lama Chodrak, CEO of Kagyu Monlam was happy to support the initiative and immediately gave Jangchup the go ahead to pursue his idea further. 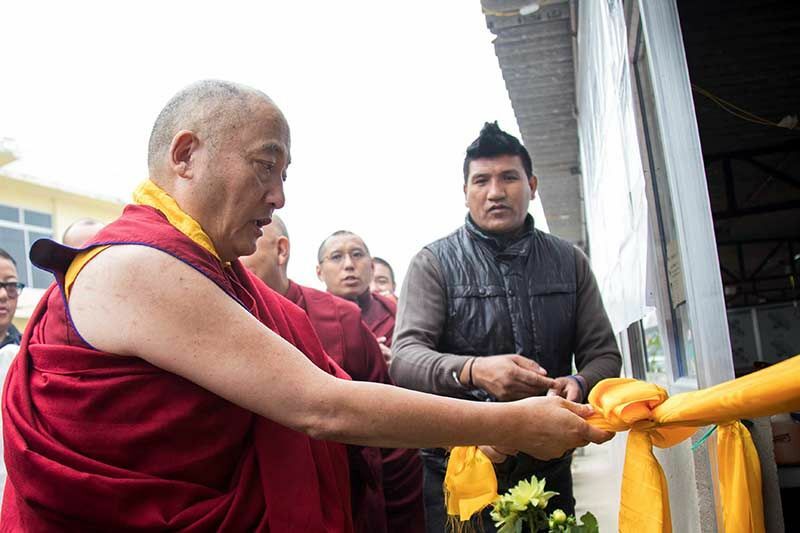 For some years the Kagyupa International Trust has been working in collaboration with the Hart Knowe Trust from Scotland on charitable projects such as the Akong Tulku Memorial Soup Kitchen. The Hart Knowe Trust was started by students of the late Akong Rinpoche and when Jangchup contacted them they were delighted to be able to help. 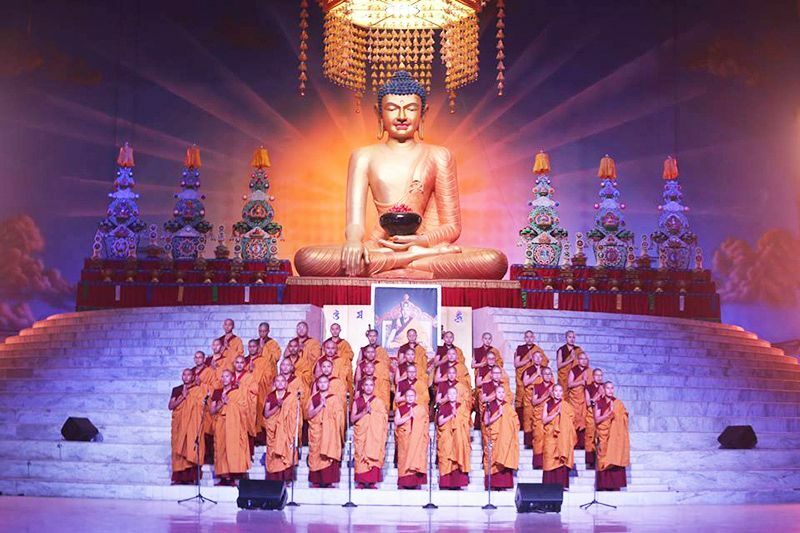 One of the trustees, Vin Harris said: “When working with Lama Chodrak and Jangchup we have often talked about finding projects that will contribute some longer term value for the people of Bodhgaya. I’m really excited to see how the Sewing Happiness Project can develop in future to help participants gain trust in their own potential as well as bringing them much needed economic benefits. 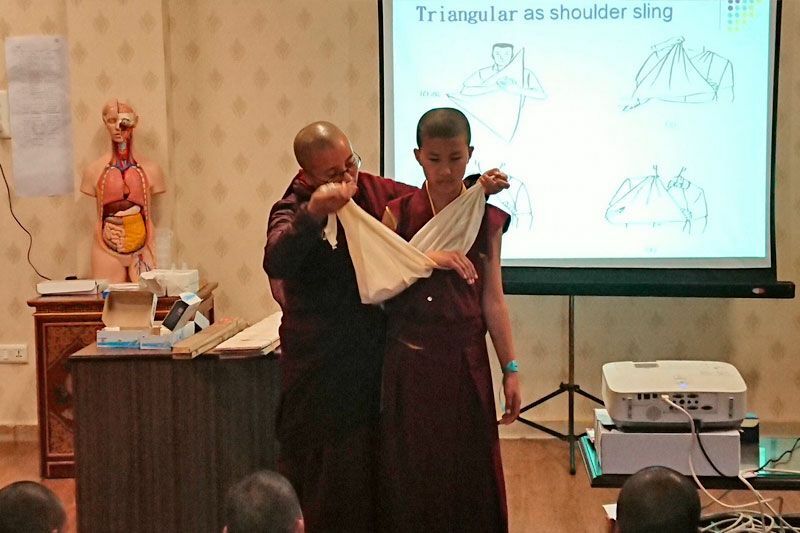 Perhaps one day the project may even be able to provide sewing services for Monasteries and the Kagyu Monlam”. Representatives of Hart Knowe Trust accompanied Lama Chodrak when he visited the Sewing Happiness Project and they were introduced to the teachers and participants. 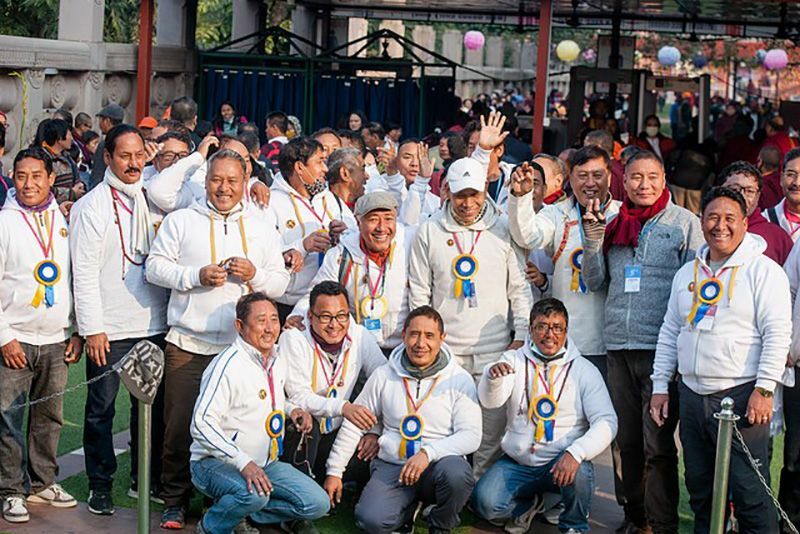 They learnt how suitable participants from Bodhgaya and surrounding villages had been selected through local connections. A great deal of care has gone into making sure the project goes well and transport has been provided for the young women to make sure they are kept safe. The teachers reported that the students are making rapid progress because they are so keen to learn such useful skills. It now looks like they will be able to learn to make three extra types of garments than had originally been anticipated. Following her visit to the project, Marilyn Harris from Hart Knowe Trust commented: “It is really lovely to see how much these young women have learnt already. They are so enthusiastic to have this new skill and seem happy to be making new friends. It is definitely a worthwhile project that can be expanded”. Following discussions with the teachers and students, Kagyupa International Trust and Hart Knowe Trust will be meeting to review what has been learnt from the pilot scheme and to consider the next steps in this inspiring journey.